Here I sit in my room back in Minnesota finally able to find time to reflect and share our adventure. It never fails to surprise me how quickly time can pass. It was just two short weeks ago when 11 students were sitting at the bus station in Buenas Aires reminiscing on our 13 days together and preparing to go our separate ways. After living the experience of Argentina and returning back to the states, my mind was a com-bobbled mess of emotions and thoughts. There were so many experiences while in Argentina that touched me in different ways. The question that taunted me from family and friends was, “How was your trip?”. My mind was just like in movies when you see a huge rush of flashbacks and memories zip over the screen before it slows down and settles into the present, that’s what my mind does every time I hear those four words. The many places and people we encountered fly through my mind and although I have so much to share, my answer is this, “It was wonderful. A very humbling trip.” Those are the only words I can find to attempt summing up our adventure. Unless each person who asks me “How was your trip?” has two hours to spare, that’s all I can say. This trip was more than I expected and more than I could have hoped. 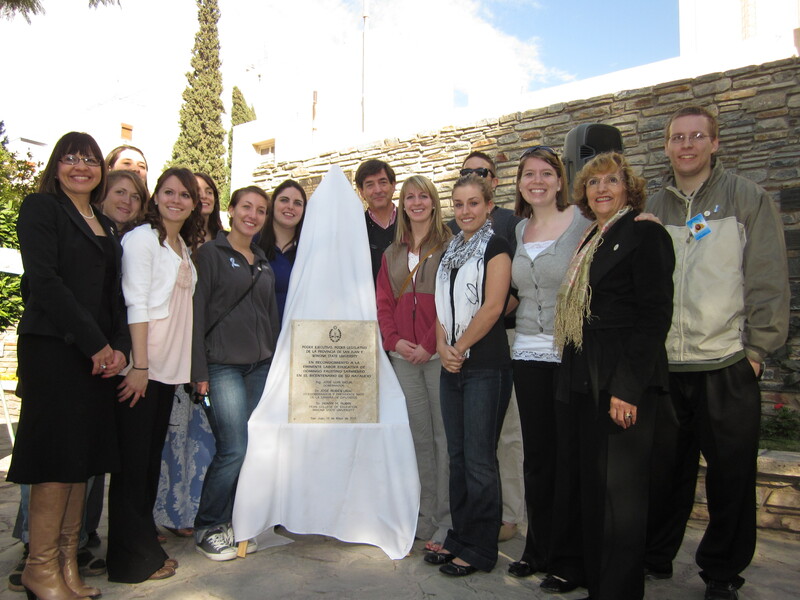 It is truly evident how important WSU was and still is to the country of Argentina, specifically San Juan. The women who traveled to San Juan 100 years ago were unbelievable. They left an unforgettable legacy in Argentina which is greatly appreciated and remembered. The people of San Juan were the most hospitalic people I have yet encountered in my short 21 years of life. I am truly humbled and struck by the gratefulness they showed and hospitality they gave. Although we were not the women who were chosen by Sarmiento to help establish an educational system in Argentina, we were treated as though we were. The actions of the Argentine people show the inner appreciation of the human heart. I have witnessed that time doesn’t kill ideas or the remembrance of great things. I will forever remember Sarmiento and the deeds of our WSU alumni because of the people of Argentina. From the large ceremonies to the small lunches, each moment of our adventure was blessed by graciousness. Sarmiento’s name thrives within the province of San Juan and leaks into the rest of Argentina. The work of our alumni and his drive have an obvious affect on Argentina. Of course there are still improvements that are needed within the educational system, however, it is much more sustainable than it would be if history never occurred. I look forward to yet another return to Argentina. I think there are large opportunities available between San Juan and WSU. Before leaving for Argentina school was starting to lose its, how to put this… oomph. Every semester started to feel the same. Classes meshed into the previous classes, teachers started losing their faces, and content began to seem unimportant. I even contemplated changing my major to get some change in my life. I relied on clubs and extra-curricular activities to bring some interest into my life. Becoming a teacher didn’t seem too appealing to me anymore. The classes were all the same to me and I felt I wasn’t getting anything out of them. Thank you Argentina for changing that. I see the importance of everything now. I started reading a textbook from last fall semester because I finally saw the correlation and the need to learn these concepts. I have something tangible that I can start planning for, at least I think I do. No matter where I end up teaching, I know that I will be prepared for my classroom. I can now envision my future students, the ways that I manage them and the methods that I wish to use inorder to guide them in their learning endeavor. When is graduation? I just want to teach. Now, I can’t get too ahead of myself here. I still need to take these classes to figure all of the loose pieces out. There is so much I have to learn yet. Part of me wants to take some of these classes over again, so I can try and extract more important information. I didn’t realize how crucial most of this information was. I mean, I really need this stuff! 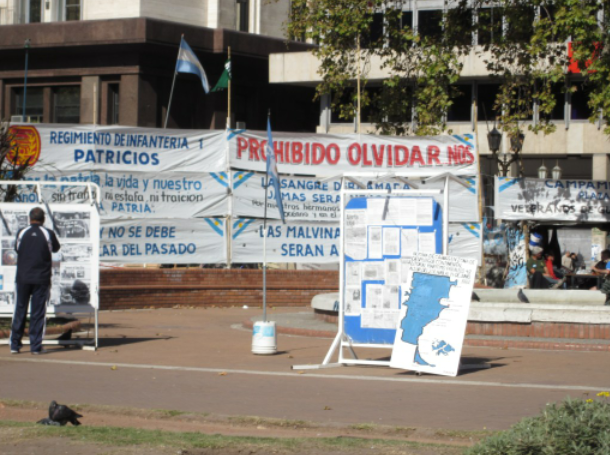 I spend most of my days thinking of my experiences in Argentina. From the classroom teaching, the meetings, the tours of schools, the times with students, everything, I think about how those moments have shaped myself as a future educator. I saw many things I could improve on in my own self, and I found some great models of the way I would like to be. 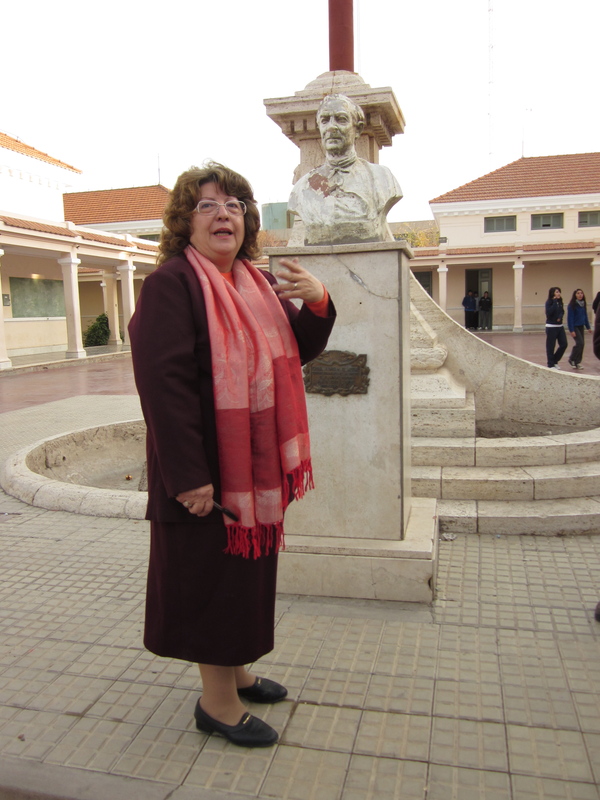 A special thank you to the director of the Colegio Naciónal. You are such a great role model, and an inspiring educator. I hope that we have the pleasure of meeting again. One of my most memorable moments of the trip was not something I did in Argentina, but is something that was said. During the bicentennial celebration at the birth home of Domingo Faustino Sarmiento the president of the foundation for Sarmiento’s celebration spoke on the legacy that was left behind by Sarmiento and the teachers who followed him to Argentina. The speech wasn’t very long, however there was one quote in particular that really stood out to me during the entire celebration. It stood out because it is powerful, and invokes reflection. We have so much to learn from Sarmiento. So much. This statement could not be anymore true. I have thought this secretly to myself many, many times; that the world’s problems will never be resolved with violence, that the best solution to begin moving forward is education. Sarmiento did this! Instead of creating a civil war between himself and those standing in his way he decided to educate his country. He looked for the answer in the most obvious of places, in the future. What happens today strongly dictates the future. So why not start at the beginning? With children. The more educated and ready for the world our children are today, the better the world can be tomorrow. I know I’m only a college student in Winona, MN, but I also know that I hold the knowledge and the power to start changing the world one classroom at a time. It sounds cliché, and it probably is, but for me, this is how I can start helping people to become good people. I won’t just teach Spanish or English, I will teach how to be a good person. I will teach how to live in society. I will model the way the world should be. I am not a soldier of violence; I am a soldier of education. I will fight to the end for the rights of each child to receive an education and for them to be able to use that education for good. This experience has only solidified my dream. We are the teachers of tomorrow. I do not want to leave this amazing place. The people we have seen and the places we have gone have been some of the best I have ever known. The people here have greeted us with open arms and were so generous. The places we have seen have been incredible. My favorite was going to the Mary O. Graham School because of the children there. I loved being able to teach in the classrooms and get to know the students. Those few days have made some of the greatest memories that I will never forget. Not only that, but this trip has definitely made the relationship between San Juan, Argentina, and Winona, Minnesota stronger than ever. Tomorrow we are going to the airport after seeing La Boca. I cannot tell you how much I do not want to leave. Yes, I miss my friends and family back home, but this country has been so warm and caring to us all. I have loved every minute of it. Luging all of our luggage throughout the airports of Minnepolis, we were able to smoothly get through customs with only dear Matthew’s luxurious lotion having to be left behind. As we got to out gate now we started our first test-the waiting game. Taking pictures galore, this would soon be, unfortunately for me, a test of what was to come for the rest of the trip. As we landed in Atlanta we met a new member of our large dynamic family. Amelia, Hank, the Dean of Education’s daughter, awaited us as we came through the doors to the airport. Knowing that she would be anticipating us I was keenly looking around fervently for a face that I may perhaps connect too. Instantly I found one. A female around the same height as myself with a comfy males sweater wrapped around her small frame with a large “mom” bag to match. I allowed myself to hon in on her for just a couple seconds but failed to receive a confirming look from her in return. Releasing my gaze sadly, we gathered up as a group. Looking at the monitors for which gate for the next direction we needed to head in, the same girl began to walk towards us. As she walked towards the dean, I knew this was her, Amelia, and she would become a great friend. One thing I need to note before leaving Atlanta was not only the back hugger, which of course I tried, relieving my pain for those sweet couple minuets while talking to the wonderfully helpful and very interesting life of a Ghana born, highly traveled student working for techy Brookstore, but another store that we came across. Shining with those letters that I grew so used to seeing on my way through Kryzco in Winona Commons was the smoothie store, Freshens. Alex could not resist reuniting with her beloved Freshens and so she quickly scored a yummy smoothie for the road. The next flight was nothing less than spectacular. Sickness overwhelming a child’s sleep and parents precious minuets as well, snoring eroding the ear drums of others and movies that did not please the eyes or mind. However, the flight was not the reason we were here it was for the children and our courageous alumni who came over those so many years earlier. For me personally, the flight was just another place to sleep. One of my best abilities being able to sleep on pretty much any surface. But let’s get back to real business. Flying into BA, Buenos Aires, this would be my second time coming to the country. I was extremely fortunate enough to have been given the opportunity by my family to visit my partner and the country during my spring break just a couple months earlier. However, I knew but had no idea, that this time would be completely different. The city was just as diverse and lively as when I had left it. We saw the “Pink Palace”and got to explore the wonderfully ornamental and stimulating offerings of the Sunday Market. The street, which was 100 blocks long it seemed, was filled with street performers, yes we saw the real Johnny Depp I swear, to Mate cups and leather purses and shoes of all variety. While eyes speedily traveled from side to side of the street trying not to miss any of the market’s spectacles, we were all unaware of the quick moving our bodies would be doing soon. After recharging with coffee and sweets, the group became dispersed. Trying to regain our group, half waited along a curb while the other was lost in the hundreds of other faces. Challenging our psychological skills we tried to think in their shoes. They were not at the cafe we had went to earlier and not around the streets near it either. The only place we could think of was the square were the Casa Rosada was at. With a small group made up of Alicia, Amelia, Alicia’s friend, Morgan and myself, we booked it in the direction of the Casa Rosada, in the Plaza da Mayo. As our feet tried to move as fast as our minds, we turned the corner and saw our lovely remaining members simply feeding the birds. As the adults released their nervous tensions, we were able to laugh off our first scary moment. I AM IN LOVE WITH BUENOS AIRES! The city, the people, the energy, the history, the architecture, everything! We only spent one day in the city but we were given the opportunity to walk everywhere. Buenos Aires is a city that walks. I don’t think I would have felt the same way about it if we had relied only on public transportation. I wanted to take everything in. There were three main things about Buenos Aires that really stood out to me as special. The street art, the history and the street market were the things that will remain present and fresh in my mind for the rest of my life. These memories will be my new mental escape. Secondly the history is extremely somber but inspiring. In high school Spanish class we had discussed many of the proceedings that take place in the capital square during the Dirty War and of course following it as well but to experience the place where Evita Peron sang, millions marched and where las madres still protest the disappearance of their children and loved ones was just mind blowing and beautiful. I took so many pictures and I am excited to share them with family and friends, but especially with my high school teachers who first exposed me to this. Finally the street market. I don’t even know where to begin. People and vendors EVERYWHERE. The further we got into the market, the weirder things got. I loved it. Even though I didn’t purchase anything at the market I still had a great time just looking at everything and experiencing. It was the experience that really mattered. The street performers were great. Just great. I really wish we had the opportunity to go back before leaving for the U.S. I guess I really will just have to plan another trip! Saturday’s article in the Winona Daily News was absolutely wonderful! Jerome Christenson had it completely right that Winona has all but forgotten the amazing legacy of the first wave of Winona teachers while Argentina has never stopped forgetting or celebrating. Just recently I was using www.livemocha.com to start learning the “vos” form that is customarily used in Argentina and I became acquainted with a fellow living in Buenos Aires. On a whim I asked if he was familiar with Domingo Faustino Sarmiento and the American Teachers. To my surprise not only did he know who they were, he had also attended a Mary. O. Graham school as a child. This was a complete stranger! How cool. What an awesome legacy to be a part of. I can honestly say that this is the most wonderful opportunity I have ever been given. The past ten hours have already been completely life changing in that I know that I am a forever traveler. Currently we are flying high above Latin America and all I can think is how hard I have worked since my junior year of high school learning Spanish and the various cultures that are a part. I have dreamt of a trip like this since I have become proficient in Spanish. I don’t think the trips of my dreams can even compare to this opportunity. Since high school I have devoted much of my time to learning the language and the cultures of the people who speak Spanish and I have never looked back. I absolutely love every single piece of information I can get my mind wrapped around. Argentina is a culture I unfortunately do not know a whole lot about but I think that’s a good thing! I have so much to look forward to and so much to learn. For a culture and language junkie like me it doesn’t get much better than this. Solo espero que me hablen en Español. I want to learn EVERYTHING I can while in Argentina. What do they eat? What music do they listen to? What types of things do they talk about? What do they think of us coming? What do they do for work? What is their city like? My list of questions is endless but I don’t even know where to begin! I am going to drink this whole experience in like a growing plant that has not been given water in a few days. I can’t even sleep! I have my music turned up, all of it Spanish. Each Spanish speaking country is represented in my extensive iTunes library… The more Spanish I am exposed to now, the more ready I will be to forget my English for the few days I am away. Honestly though, I really don’t need music to be ready to speak only Spanish for any given amount of time. I have been waiting for this. Porfavor hablame en español! Looking at the lights far below make me think of the people living beneath them. What are they like? Who are they? What are they doing now? Probably sleeping considering it’s close to 2:00am (12:00pm Winona, MN time.) All I wish is that I could be there… experiencing the life in their towns. I can hold out though, for Argentina. I will just have to make sure to start planning my next adventure immediately. But to which place? So many questions and I feel that 12 days (now 11) will not be nearly enough to answer all of them or even to scratch the surface of everything I want to know. I have never traveled internationally before. Many people cannot believe this because of my strong love for the cultures and experiences of all the people I meet. Each new opportunity for me to learn about someone new is a way for me to feel more at peace with the world and myself. I love everything I have ever learned about my international friends and each and every one of them has convinced me to travel abroad, whether they realize that or not. The world is a beautiful place because of all the cultural diversity that it holds. All I have ever known is the U.S. ways and I am extremely excited to be able to start learning, first hand, the culture of another. Who knows, maybe I won’t return. I’ve already warned my mother. I think she is expecting it from me. I don’t even want to sleep. I might miss something. I understand that we are super high above the world and nothing too interesting can happen on this flight but the people I have the potential of meeting! Why waste ever opportunity to get to know someone new? If I don’t sleep now, I will be too tired to pay attention to anything later. We are in the air now and I am excited about the lights below me… what am I going to be going to do when we are in a bus and the culture is going to be surrounding me? I am going to drown in the only substance that makes me happy. I cannot wait! I started this out as a blog post, but clearly it has turned into something very, very different. I will just have to pick and choose the best passages of what I have written here. But how? I can’t even think of figuring out how to choose a picture or media file that perfectly fits what I am feeling right now. Or at all. Since Minneapolis I have been in a daze. In Atlanta, GA I still didn’t realize what was happening to me. Even still after seeing the lights in the distance I have no idea what to expect. My level of excitement is steadily growing. I don’t even think I will be all that excited leaving the plane, or walking around the airport. Hasta que puedo ver el paisaje y mirar todo que hay en Argentina no voy a saber como estoy emocionada.